Baba Commandant And The Mandingo Band - Siri Ba Kele. Vinyl LP. Bleep. Burkina Faso’s Baba Commandant And The Mandingo Band return with the follow-up to their excellent debut LP Juguya. Siri Ba Kele finds the group taking influence from Burkinabe funk and Mandingue guitar music for a set of sparky and infectious tracks. 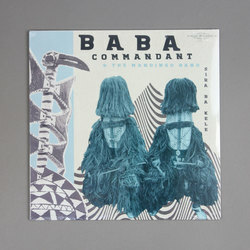 Backed by some superb playing from every member of his band, Baba Commandant’s charismatic presence up front knits together the propulsive grooves of tunes like ‘Siguisso’. The strutting ‘Keleya’ shows some influence from the ‘70s funk sound of nearby Nigeria.